OK, so I already missed a post, but it wasn’t on purpose. Plus, day 4 wasn’t all that exciting because I got addicted to those soba noodle salads and have basically been eating them for every single meal except breakfast. Day 5 however, was extremely exciting! I even switched up my oatmeal flavor in the morning! Ok, so I only switched it up because I ate all the bananas, but it still counts. I got the hint though and we got 3 bunches of bananas for the week instead of just 2, which got us plenty of weird looks at the store, but who cares. So anyway, back on track. 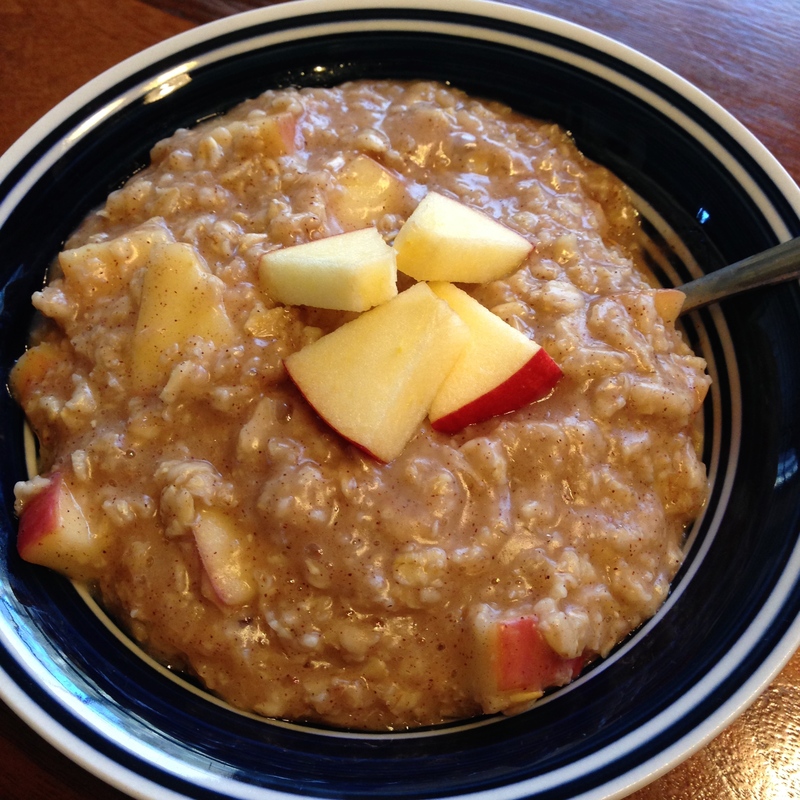 Yesterday I had some apple pie oatmeal for breakfast, then my mom and I headed out to do our weekly grocery shopping. Every Saturday we sit down with a notebook and write out a list of 7 dinners and a grocery list to go along with them, including any other household staples, like bananas ;). This is our way of budgeting and so far it seems to be working out really well. With the exception of our loading up on Whole Soy yogurts (no, I haven’t been eating them this month, but you bet I was that last week of March!) because they are going out of business and we are devastated. Lunch was super simple- 3 sweet potatoes and 2 oranges. Don’t worry, I’m getting to the exciting part, I promise! After a long afternoon of shoveling mulch and weeding, we came in to start on dinner, which we had planned to be chickpea tuna salad sandwiches. The only problem is the vegan mayonnaise the recipe called for. We usually just use Just Mayo because it is the bomb diggity and we haven’t had any success with making our own vegan mayo in the past. However, that all just changed and your mind is about to be blown! Before our vegan days, we used to make our own mayonnaise with an egg, vinegar, salt, and oil, so it’s pretty hard to veganize that one at home. Until now. Remember the whole chickpea meringue craze? Right, well since then the chickpea liquid has been used in baking, marshmallow making, all kinds of new things! Then we wondered…. will it work to make mayo??? Long story short, IT TOTALLY DOES!!! Is your mind blown yet? Because mine sure was after I made it. Tastes just like mayonnaise. 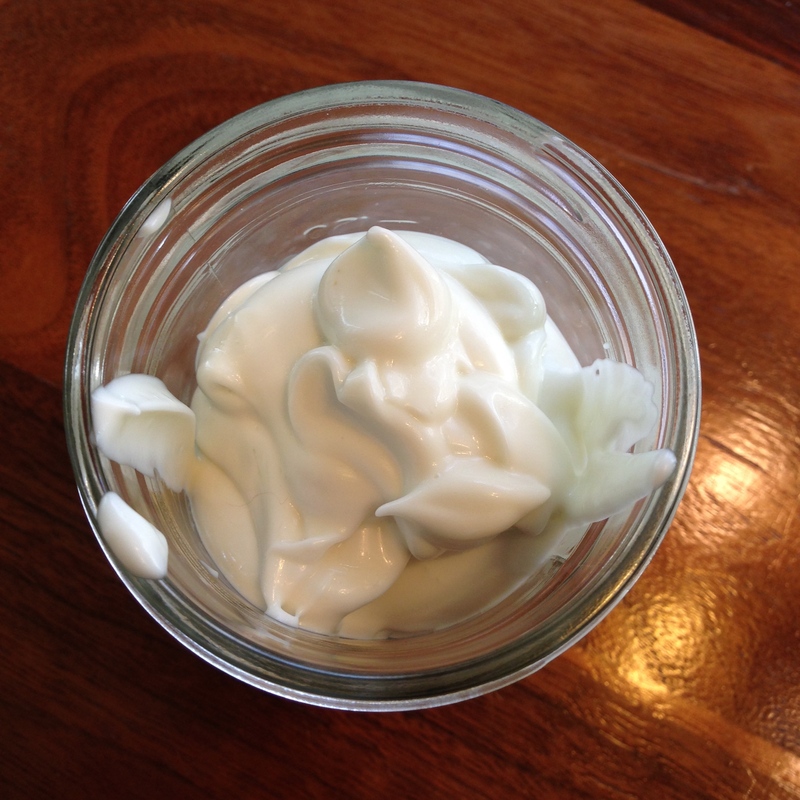 So, without further ado, I present unto you: homemade vegan mayonnaise! Using an immersion blender, in a small bowl (I actually did this in a small measuring cup like in the picture above, but a small bowl will allow you to mix it better once it starts to thicken up), combine the vinegar, ground mustard, salt, and chickpea liquid and mix for just a second so it’s all combined. With the immersion blender running, slowly drizzle in the oil 1/4 cup at a time. The mixture will start to become very thick and you will need to move the immersion blender around to get it all combined. Once the mixture is nice and thick (i.e. 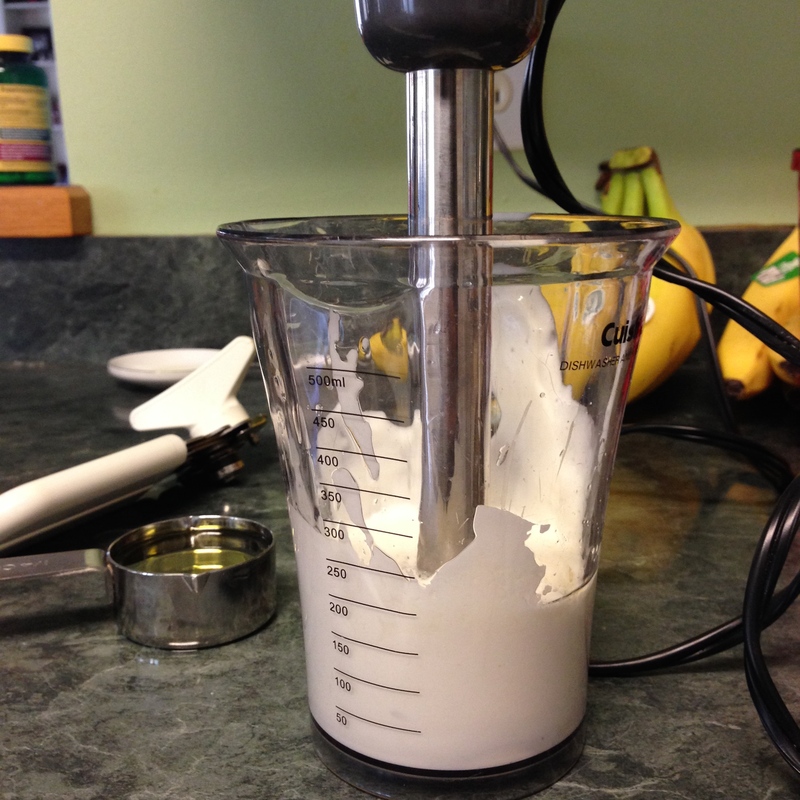 it doesn’t run/pour off the immersion blender when lifted out of the mixture), stop adding the oil. Try not to happy dance so much that you injure yourself. Not that I know from experience. 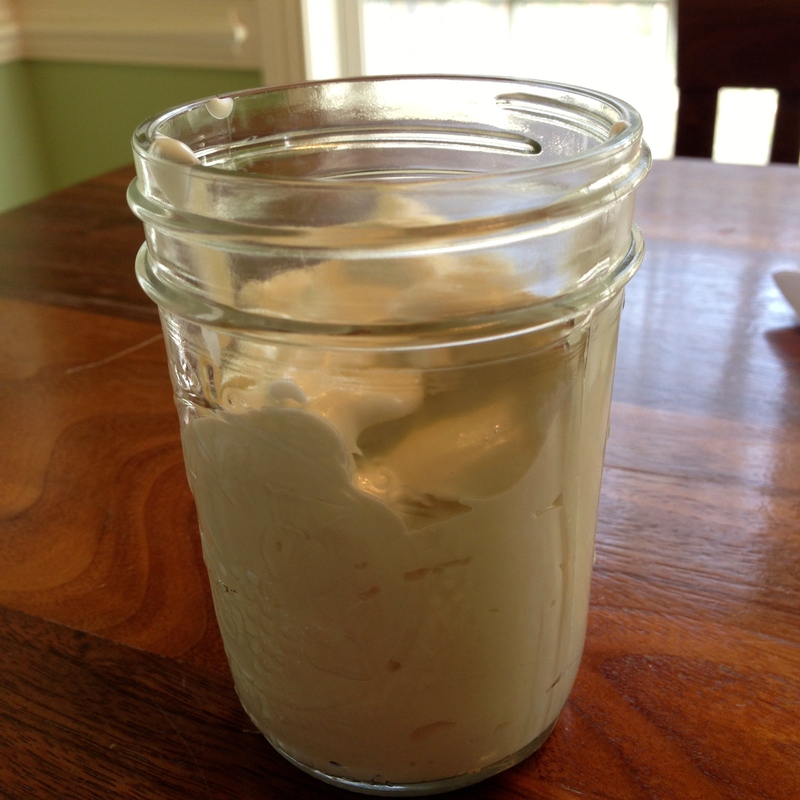 Transfer the mayo to a jar and store in the fridge. The mayo will thicken up upon refrigeration. Use in place of mayonnaise in any recipe. This recipe is meant to taste just like traditional mayonnaise that is made with eggs, which it does. If you would like for it to taste more like the Follow Your Heart Veganaise, try adding only a teaspoon of vinegar and up to a teaspoon of maple syrup or other liquid sweetener in towards the end of blending. If you make this recipe tag #PeanutButterAndVegan so I can see all the wonderful pictures and if you’re playing along with April All Natural, remember to tag your posts with #AprilAllNatural!